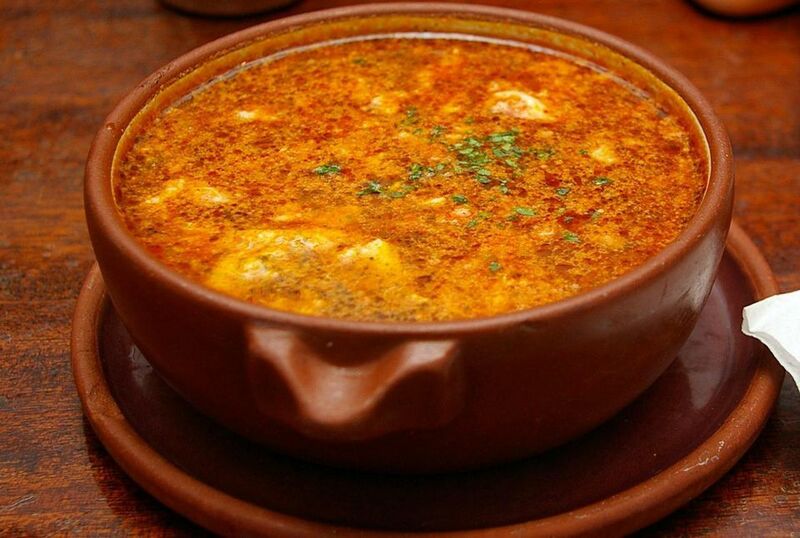 Sopa de ajo (garlic soup) is a very old, Spanish, peasant-style dish and is typical of Castilla-Leon regional cuisine, where the winters are cold and soups and stews are eaten daily. Castilla is the "land of bread," and it is bought fresh daily. However, a Spanish cook would never serve it stale, so this recipe is a good way to use any stale bread that is left over from yesterday’s meals. However, the most important ingredient in this soup is definitely the garlic. Before the garlic turns brown, add the cubed ham and the slices of bread. Sauté for a few minutes on medium heat. Add the sweet paprika, followed by the water and salt. Bring to a slow boil. Boil for 5 to 10 minutes. To poach the eggs, carefully break them into the soup one at a time. Scoop out poached eggs one at a time into soup bowls and then slowly ladle the soup into each bowl.